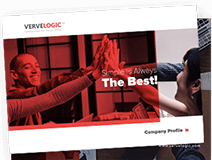 My site ranking was not good , I was facing the problems , then I hire VerveLogic. Now we are top and very happy. These guys are really Genius. Very satisfied with the performance of Vervelogic. They delivered all the functionality in time and to quality. Very satisfied customer.. This was a more complex project and yet again I'm completely satisfied with their work. They even provided me with documentation with scenarios and examples. Really great job guys!